Fruit used for bottling must be fresh, firm, and free from discoloration and disease. Wash hard fruits in cold water and leave to drain in a colander. Soft fruits can be soaked for a few minutes in salted water to remove any grubs or insects, rinsed in fresh cold water and left to drain. When bottling in syrup, the addition of some ascorbic acid will help to maintain colour with fruits like apples and apricots that discolour easily. By adding 200–300mg of ascorbic acid (vitamin C) to a litre of syrup you prevent discoloration. It’s available quite cheaply as a powder. You only need a third of a gram, so half a teaspoon seems about right. Most varieties of tomatoes (all the heritage types) are fairly acidic which assists in the preserving process. However, some newer varieties are very sweet which has been due in part to breeding for reduced acidity. These sweet varieties with low acid are best pressure bottled rather than being treated like fruits with oven bottling. Your seed supplier should be able to tell you if a new variety is low acid. Pick your vegetables young and process as soon as possible after harvest. They should be thoroughly cleaned or peeled as if preparing to directly cook them. Cut into reasonable sized pieces if appropriate. It’s quite a lengthy process to bottle vegetables and we’d really advise freezing as being generally more appropriate. 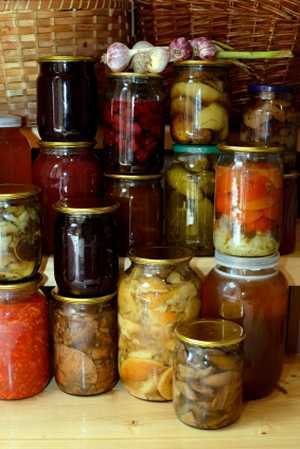 However, bottled vegetables don’t require power to keep them frozen and aren’t vulnerable to power cuts. You need to blanch vegetables just as if you were freezing them to retain the colour before pressure bottling them. We’ve covered the method for the most popular bottling vegetables. Apples and Pears – Peel, core and cut into quarters or slices and place into lightly salted water to prevent discolouration or add some lemon juice or ascorbic acid to the water. Rinse quickly in cold water before packing in jars. For a solid pack, prepare as above and blanch in boiling water for 2 or 3 minutes or steam over boiling water until just tender. Pack warm. Apricots, Peaches, Plums and Damsons – Remove stalks and rinse. May be bottled whole or halved with the stones removed. If halved, pack quickly cut side down in jars before they discolour. Strawberries – Hull and rinse the berries carefully. Blackcurrants, Redcurrants and Gooseberries – Top and tail. Wash and drain well before packing into jars. Gooseberries can tend to wrinkle in processing. To avoid this make a nick with a knife in the bottom of the fruit. Cherries – Remove stalks and rinse. Citrus Fruits – Remove the peel and pith, break up into segments and discard any pips. Blackberries, Raspberries and Loganberries – Remove stalks and rinse. These fruits attract maggots so pick over carefully then soak in lightly salted water for 10 minutes and any bugs will float to the surface to be removed. Rhubarb – Remove leaves and base, wipe sticks and cut into even lengths suitable for the size of the bottle. Young rhubarb is sweeter and more tender than older stalks. Pineapple – Cut off the outside peel, top and tail and then slice into rings or chunks. If bottling as rings, do check the jars are wide enough to take them. Tomatoes – Remove stems, wash in cold water and drain. Pack with or without the skins. The skins can easily be peeled off if the tomatoes are put into boiling water for 5 to 15 seconds and then dipped in cold water. For a solid pack, cut in halves or quarters. Pack tightly in the jars, sprinkling salt on each layer. About 1 teaspoon per pound of tomatoes is all you need. If the tomatoes are very acid, you may find it worth adding a teaspoon per pound of sugar along with the salt. Press the tomatoes well down in the jars but do not add any liquid. Asparagus – Wash and trim the tough end off the stalks. The tough portion can be used in soups. Blanch the stalks and place in the jar thick end down. Broad (Fava) Beans – remove the beans from the pods. The processing can turn the beans brown even when blanched. This seems to be related to the variety grown. French and Runner Beans – Wash, string runners, and cut to appropriate length for the jar. Blanch and pack into jars. Peas – If you have a problem with pea maggots, pod into a bowl of salted water and they will float to the top. Blanch and pack into jars. Sweetcorn – We find it easier to blanch the whole cob and then, using a sharp knife, remove the kernels which are packed into jars. Sweet Peppers – With peppers it can be easiest to quarter and de-seed, then blanch and then remove the outer skin before bottling rather than trying to remove the skin before blanching. Fruit may be bottled in syrup, water or a brine solution. Syrup is preferable as it helps to preserve the colour and flavour. The strength of the syrup depends on the sweetness of the fruit and how it is packed. For syrups the proportions are generally 8 ozs (250g) to 1 pint (600ml) and water. The sugar for use in syrups may be ordinary white granulated or, for a different flavour, honey or golden syrup. Dissolve the sugar in half of the water over a moderate heat and, when the sugar is dissolved, boil for one minute. Then add the remainder of the water. Doing it this way saves time in waiting for the syrup to cool sufficiently for use. Bottling Brine for Tomatoes etc. A brine solution is best for tomatoes and vegetables. Make it with 1oz (30g) of salt to 1 litre of water. If they are to be packed solidly no water is necessary but 1 teaspoon of salt should be added to each 1 lb (450 g) of tomatoes.